A 47 year old Santal cultivator from Birbhum, Sanjoy Mardi has been making Dhodro Banams since he was about twenty years old. 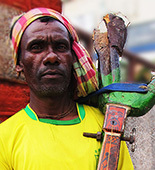 He learnt the art from his grandfather, but makes the instruments only occasionally, whenever the fancy takes him or whenever requested to by the village boys, if he has the time. His children, who are currently studying, do not share his interest.